Before and after for three names on page 3. Before and after for page 4. Update for some of the men on these pages in terms of which medical facility they came from before boarding 31 Ambulance Train and where they were discharged to. While too much shouldn't be read into it, it must be a strong possibility that most if not all the men that boarded from the same location came through the same place, (1 CCS at Chocques, 7 CCS at Merville for example) and those that disembarked at the same location on the same day with similar health problems may well have ended up in the same hospital - most of the STD patients identified for these two pages seem to have ended up at the 51st General Hospital at Etaples for example. Similarly, while too much shouldn't be inferred, for the men from these two pages who have other surviving records, a 'blighty' seems to consist of boils, hernias. gonorrhoea, dysentery, epilepsy and eczema! One last update. On page 6 Private 15671 F. Robinson, 1/5 Cheshires could not be identified. In fact there are service records for him that show him going on to be renumbered 244271 and subsequently transfer to the Royal Engineers with service number 447200. There is a MiC showing those numbers and also has him as 1383 Cheshire Regiment and WR/150271 Royal Engineers. It's just simple visual cues for me. I was colouring by ward in case it provided any clue as to where these men came from and went to. In many instances the ward record goes across at least two pages in the original document. That imposes an arbitrary division that it doesn't make sense to persist with in any investigation. The names highlighted in yellow are the one where they could not be identified in the original run through, otherwise I just kept your original black or red text colours. I'll attach the spreadsheet when I'm finished. If it's proved to be of any value I'll retain the colour coding. This is the first page with an overlap with another set of admission and discharge records that are on FMP. They are for No.18 General Hospital. Some of the relevant service records show this as being at Camiers, while one says Dannes, Camiers. The LLT shows No.18 being at Camiers from February 1915 to June 1915 when it was taken over by the US Army. There are also references to men being transferred to “6CD”, (on other pages and in some service records, “6 Con Dep”). My working assumption is that refers to No.6 Convalescent Camp. There are online references to that being at Etaples. Three further note about the admissions and discharge book for No.18 General Hospital which is relevant to all the pages that relate to the 31 Ambulance Train arrival on the 20th January 1917. The first is that the order of the entries in the Hospital book does not parallel those in the Ambulance Train one. Part of the reason I started looking initially was to see if this shed light on the names that could not previously be identified. Thus while there are some candidates, and this means that all the entries in the Hospital book for British soldiers can be matched up with the Ambulance Train, (important caveat – but not the other way round), it does depend on assuming that all the queries in both sets of records tie up. Thus for example, the Ambulance Train Casualty 21098 on page 8 is shown as Private 18505, A. Prennser, C. Company, 11th Royal Warwicks, diagnosed with Trench Foot. There is no match on the No. 18 General Hospital records for that name, but there is a Private 18585 A.T. Primmer, C Company, 11th Royal Warwicks diagnosed with Trench Foot. There is a MiC for A.T. Primmer. The second is that as well as the British patients shown as arriving aboard No.31 Ambulance Train at Camiers on the 20th January 1917 on the Hospital Records, there are also a number of Canadians as well. Either that is an error on the part of the Hospital clerical staff, on the clerks associated with 31 Ambulance Train must have kept a separate register. Either way it calls into question the accuracy and completeness of these books as a sourced of factual information unless it can be adequately confirmed from another source. Finally, in the admissions and discharges book for No.18 General Hospital there is a curiously titled final column. The clerks who completed it at the time probably understood and completed it in a standard way, but to me it is so nebulous that I doubted whether there was any point using the information. Number and page of case book to be quoted for all cases recorded in it. In transfers the designation of the hospital or sick convoy, to which or from which transferred, must be noted here, and any other facts bearing on the man’s destination; also in moveable field hospitals the place where the admission, &c. took place should be indicated. Place of action to be noted in case of wounds and injuries received in action. The entries in the column are either a place name, a ditto mark or blank. All have a date. As the men were all transferred in and transferred out, the ambiguous wording in the column header could mean a variety of scenarios apply. However the dates are before the hospital admission so the logical interpretation is that for combat wounds and injuries it’s the location where they happened and for everything else it’s the moveable field facility, (Field Ambulance, Casualty Clearing Station), that they first reported to. I’ve therefore shown the place, with a question mark, in the “From” column. So here's what I could find out for the men listed on page 7. Update 06/01/2019 - when I looked originally at the book for 18 General Hospital, the list finished at the bottom of a page and there were then several pages to the end of the book detailing operations carried out - surgeons names, etc. I assumed there were no more patients who disembarked from No.31 Ambulance Train and were taken to this hospital. However as I found when researching names from later on in the Ambulance Train list of patients, FMP have the next volume of the records from the hospital and the first half a page in the new book are more patients transferred from the train. This provided some more information for two of the names on page 7, including details that might provide a clue for one of the unknowns. 31 Ambulance Train has patient 21088 as Private 12762 C Rodgers as C Company 11th Battation Royal Warwickshire Regiment, diagnosed with Albuminuria. 18 General Hospital has Private 14812 C H Rodgers, B Company, 13th Battalion attached 11th Battalion, Royal Warwickshire Regiment, disgnosed with Bronchitis. Attached is an updated cut of the spreadsheet. If nothing else this kind of exercise keeps my head in the right place should the chance of the odd days work come along. Few updates to the above. Patient 21091 Corporal F Allcroft is shown as "D" Company, 13th Londons. 18th General Hospital records him as "C" Company. (He has GSW head, so company may be relevant). Patient 21095 Private 61834 G. Hill 13th Royal Fusiliers, (no matching MiC). 18th General Hospital records him as 4th East Surreys attached 13th RF - but still no MiC. Patient 21096 Private 5329 G. Atkins, 14th Londons, (no matching MiC) with Compound fracture of tibia and fibula. I speculated it was possibly 5327 Garnet S Atkins. From his service record it was possible to identify that 5327 Garnet Atkins was admitted to 11th General Hospital at Dannes, Camiers, on the 20th January 1917. He was treated for fractures resulting from an accidental GSW. The damage was so severe he was subsequently discharged. Patient 21097 Private 4206 T. Shayler, 13th Londons, (no matching MiC). You believed him to be Benjamin Shayler, this regiment and service number. 18th General Hospital records him as B. T. Shayler. Patient 21098 Private 18505 A Prennser, "C" Company, 11th Royal Warwicks, (no matching MiC) being treated for Trench Feet. I speculated it might be 28959 Albert C Rencher. In fact 18th General Hospital records him as 18585 A.T. Primmer, same unit and condition. This is a MiC match for those details. Patient 21144 Private 28645 J Chrystal, 2 KOSB, is shown on his 18 General Hospital record as Fife & Forfar Yeomanry, attached 2 KOSB. Before and after where this can be identified. I'm absolutely sure it all helps to track down the correct details. Brilliant work, Peter! Patient 21152 Private 1604 F. Anderson, 694 TMB, who I speculated could possibly be 16/1604 Frank Anderson. His 18 General Hospital notes show him as Northumberland Fusiliers att 9 KOYLI, Att 64 TMB. Patient 21177 Private 3633 W. Ledgley, B Company, 8 Royal Warwicks, who could not be identified. 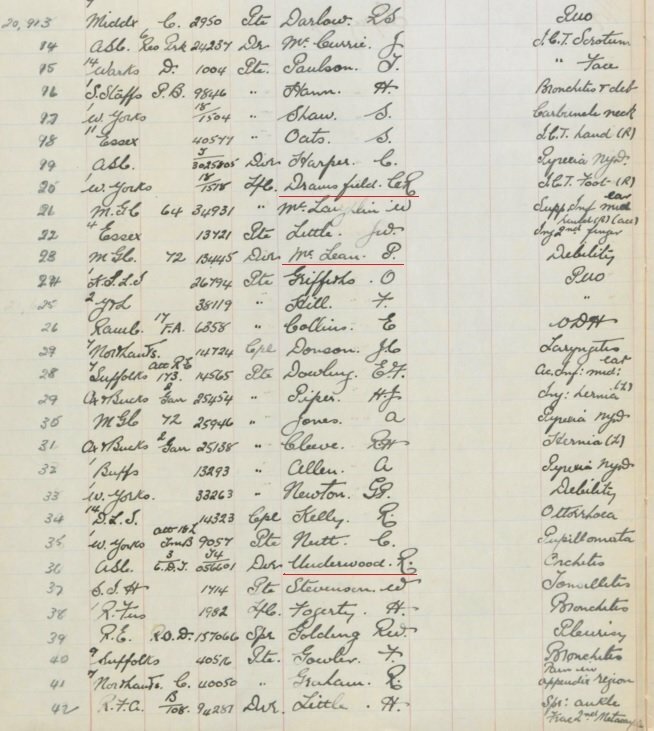 FMP have transcribed his surname in the 18 General Hospital records as Sedgley and put him in C Company. Still no likely MiC match. Patient 21179 Sapper 25011 E Denyer, 158 Tunnelling Company, Royal Engineers, who also could not previously be identified. On FMP there is a Silver War Badge for 25011 Ernest George Denyer, Hampshire Regiment, who had served overseas. The National Archive have it catalogued as 2501(Incomplete), but Ancestry show it as 25011. Many men were temporarily transferred to Tunnelling Companys from Infantry Battalions and subsequently returned. It may simply be that the MiC and Service Medal Roil don't reflect this. Patient 21191 Lance Corporal 30401 H Saunders, 5 Company, 1st Devons who could not be identified. FMP has transcribed this record as Sanders but still no obvious MiC match. Patient 21204 Lance Corporal 647 C Gorsloe, Railhead, Army Ordnance Corps, who I suggested might be S/6471 William Parsloe. The 18 General Hospital records have him down as 'Wm. Alf." Parsloe. Patient 21210 Private 45738 H Gray, 10 KOYLI who I suggested might be 43738 Andrew B Gray. The FMP site has transcribed the same data with the service number 43738.